As a child of the 80's, its easy to see why so many films today are being taken from the cartoons of my upbringing. In an age of CGI where the idea of limits has been all but abandoned, shows like Teenage Mutant Ninja Turtles, Transformers, and G.I. Joe are just the right combination of crazy and awesome to fit right in with our current tastes for high concept summer blockbusters. Prior to the 80's, cartoons were a bit different, and most attempts to update them for modern audiences have been pretty depressing (A short list: George of the Jungle, Dudley Doo Right, Underdog, Josie And The Pussycats, Mr. Magoo, stop me when I hit a good one...). Perhaps the worst of these was The Adventures Of Rocky And Bullwinkle, which you might remember as the first time you realized Robert DeNiro might be going senile. 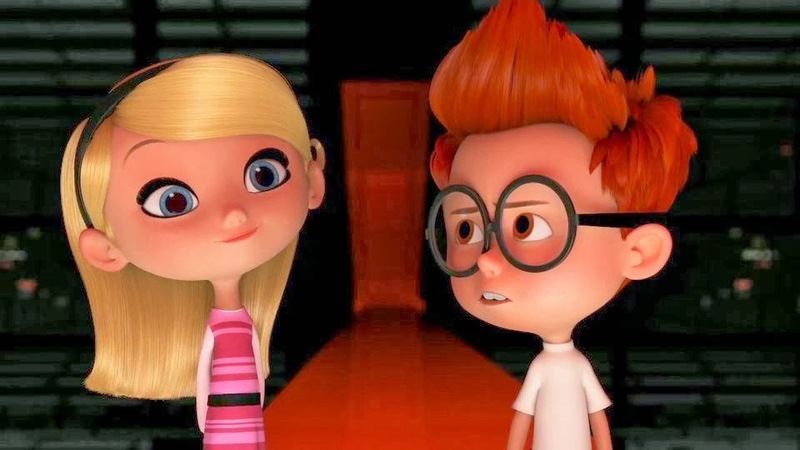 Well, now we have the latest attempt in Mr. Peabody and Sherman, another from the mind of Jay Ward no less, and as I'm suddenly remembering I forgot to add Alvin and the Chipmunks to that list, I hesitate to say that we might have actually found a halfway decent one. 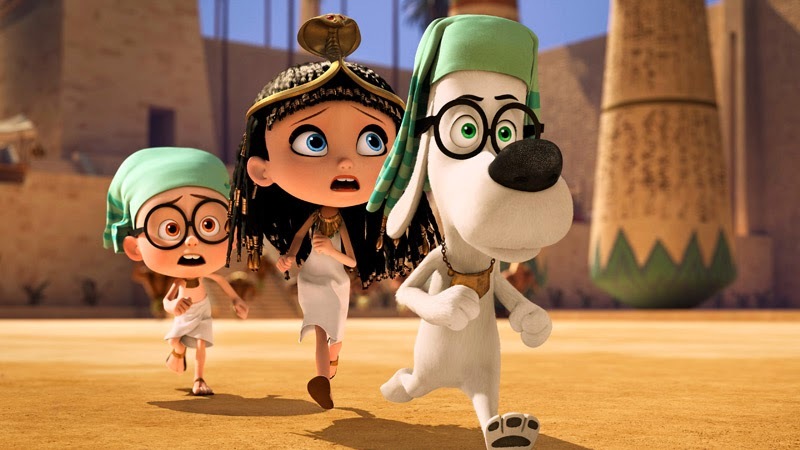 Mr. Peabody And Sherman is the simple and easily relatable story of a super intelligent dog who adopts a human child that he then allows to accompany him on his many adventures back in time via his time machine. Okay, here's the thing, when you make a movie based on a property that the vast majority of your likely very young audience has no frame of reference for, it might not be the best idea to go with one this convoluted. Maybe kids are different these days, but if this movie had come out when I was a kid and I had never seen the show it was based on, even my tiny little mind would have found this movie's basic conceit to be somewhat impenetrably strange. I guess in retrospect its no less weird than it was originally in the TV show, which I loved when I actually was a kid, but as a stand alone vehicle without that context to draw from, I can imagine a lot of kids today might feel a little out of their element. It wouldn't be so bad if the movie didn't throw you right in before you get a chance to deal with it, which again was fine for me since I was prepared, but maybe not for the Pokemon addled brain of the 5 year old next to me in the theater. Even for me it took a little while to settle in to this world enough to engage with the story and actually start laughing. The pacing is oddly unforgiving as it speeds from one location and complication to the next, which I suppose is now the norm for kids movies and wasn't even as pronounced or as annoying as the recent Lego Movie, but this is one twenty eight year old geezer who would appreciate it if things could maybe slow down a minute every now and then. The film does just enough to establish its characters as people you have a reason to care for, in this case a father and son whose relationship is strained by their inability to relate to one another beyond superficialities, and we get this only in short bursts of genuine feeling in between madcap adventures that flit by fast enough to give the more interested viewer whiplash. If you come into the movie reasonably wanting nothing more than a colorful roller coaster ride and couldn't care less about the characters or their respective growth, this is a film that does everything in its power to deliver. I just wish it had done a little more for the rest of us. 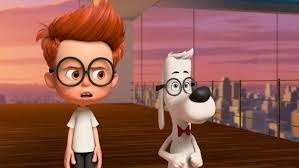 That's not to say that Mr. Peabody and Sherman is devoid of emotionally rich moments, only that as is typical for Dreamworks, they are all too often overwhelmed by the cartoonishly explosive appeal to ADHD addled toddlers. A few beats here and there are actually surprisingly poignant, and as much as I wanted more of them, I obviously recognize that a greater focus on this element, more welcome perhaps in a pre-Cars era Pixar movie, would have transformed this into something other than what it was intended to be, and likely something less appealing to its target audience. What we get instead is enjoyable enough for what it is, basically a series of set pieces allowing for one or two inspired gags followed by a thrilling escape, surfing through the sewers of Revolution era France, exploring a pyramid tomb in Ancient Egypt, or chasing a runaway Trojan horse. These action sequences are oddly enough where the movie shines, which isn't to say that the film is lacking in genuinely funny humor, as much as the humor is not always the primary focus. 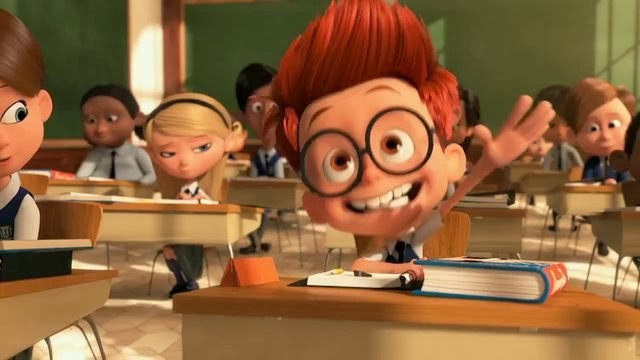 At the end of the film, a little kid sitting behind me stood up and articulated what might be my biggest problem with the movie, loudly proclaiming that while he liked Mr. Peabody and Sherman, he very much did not like "the girl." While it is understandable to want to add a new dynamic other than father-son or teacher-pupil by adding a third character to the mix, this time around we get one of the worst third wheels imaginable, made only slightly more annoying by the fact that she's an original character wedged into an established duo. Its not that she's new, its that she's awful, and I mean as a person. She is that sort of irredeemable jerk that make movies like Identity Thief and 21 And Over unbearable to watch, where they are established as terrible, and you know the whole movie is going to be spent trying to force you to like and forgive them, so much so that it only makes them come off even worse for the effort. She starts out as a jealous bully who almost gets Sherman taken away by child services, never apologizes for it, and never really gets held accountable for anything she does. And then half way through, Sherman inexplicable falls in love with her, despite her only ever treating him like garbage by that point. 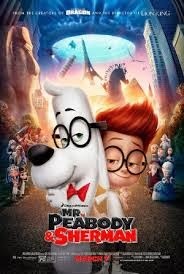 Luckily, the rest of the cast fares much better, with Ty Burrell turning in a pitch perfect performance as Mr. Peabody, only just overshadowing Max Charles' Sherman, if only because they give the wittier character all the best lines. Their jaunt through history brings them into the paths of various historical figures, most with one defining cliche, Marie Antoinette as a gluttonous aristocrat, King Agamemnon as a brutish lout, and so on, but save Mel Brooks in a blink and you'll miss it cameo as Einstein, they're all given their moment to shine and then left behind before they can overstay their welcome. That is until the third act when a notably less hokey than expected calamity causes the space time continuum to collapse, bringing them all back to the present day to predictably wreak havoc. This was perhaps the one action set piece of the film that can be said to be a bit underwhelming, in that it takes elements from every other one and brings them together only to ultimately just stand around and watch the movie end, but by that point, you're either on board or you're not, and I must say that I was despite a few misgivings along the way. 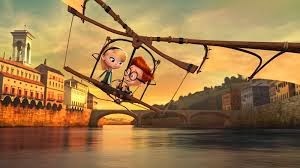 At the end of the day, Mr. Peabody And Sherman is a mostly entertaining family film and a fitting tribute to its source material, probably serving as the best adaptation we were likely to see of such a bizarre premise. It has a few hiccups here and there, but nothing so aggravating as to ruin what is otherwise a delightful, and at the very least pleasantly distracting experience. If only by default, its easily the best movie ever made out of a Jay Ward property, and maybe even in the top ten movies based on cartoons in general, which again isn't really saying much. While it lacks the power or unbridled joy of a Frozen, it falls into a comfortable zone of quality along with last year's Cloudy sequel and the somewhat underrated Free Birds, easily surpassing at least half of the animated movies released so far this year, since technically that list only includes The Lego Movie and The Nut Job. Okay, better than The Nut Job isn't that much of an endorsement either, but you get what I'm saying.